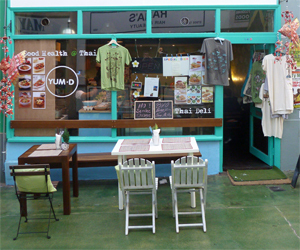 YUM-D calls itself a Thai deli and cafe and, for my money, is now serving the best Thai food in Brixton. Positioned next to Rosie’s cafe in Market Row it’s in the space that was briefly Good Bench Coffee House. It’s an intimate space but it looks and feels authentic, with the emphasis on the food and the flavours. It also sells a few Thai foodstuffs including some spicy prawn crackers and, rather randomly, t-shirts and hats that I presume come from Thailand. I feel that this review should have been done a few visits back but as Kaosarn is lauded as the best Thai in South London we felt that a few visits could only justify the fact that we believe YUM-D is both more interesting and enjoyable than the former. On my first visit I had the special, Soo-Ki-Ya-Ki, which is glass noodles with vegetables in a spicy sauce with a choice of chicken, beef, prawns and tofu. The spicy sauce is really a soup and is apparently made from chilli sauce, oyster sauce, sesame oil, minced garlic, a few hot chilli, lime juice and chopped fresh coriander. There was even more chilli if required but it was hot and tasty enough for me without. I chose the prawn version and was rewarded by a good portion. I returned a couple a days letter and checked out the pad Thai just to make sure the place was as good as my first impressions had suggested and the answer was, yes, it was. We also tried the chicken satay and the green Thai curry with coconut rice. The curry was creamy, spicy and tangy, everything a Thai curry should be. After spending some time in Thailand myself I am always trying to find the same quality of green curries thatI enjoyed during my visit and I think I may have struck gold. It is also excellent value for money, particularly given the quality of the food and the good size of the portions. The menu includes all the Thai standards as well as starters and the interesting additions of Thai salads. The staff are friendly and the atmosphere is cosy. Meal came to about £20 for two of us with one starter, two mains and tea, great value considering the quality of the food. Tables were available at lunch time, not sure about the evenings but please head down here if the queues at Kaosarn are ridiculously long and you want a traditional and delicious Thai meal. I had Thai laksa and ginger tea there a week ago, it was fabulous and fantastic to get the real taste of hot laksa in a winter time. The portion a bit too much for me so I brought some of the dish in the hotel for my late dinner. I enjoyed so much having great meal in this place definitely most recommended for all of you. Get the Asian flavor in this place…..
Well I went there and tried pad Thai , wow ! that was blown away ! Was delicious , truly authentic . They only open in lunch time until 5pm for sunday to Wednesday . But Thursday to Saturday they are open till late for evening dinner (according to their staff source ) . Does anyone know the opening times? They were shut when I went by on Monday evening, and it seems like their phone number is invalid (was 020 7274 882). Thanks!